Flashing Leaks: Flashings are the metal sheets that cover areas on your roof like skylights and chimneys. While these flashings are meant to prevent water damage, they are common sites for leaking. Look for corrosion, and use roofing cement to plug small holes. Larger openings will require replacement flashings. Ice Dams: What is an ice dam? It’s a wall of ice that forms in the lowest area of your sloped roof, blocking proper drainage and creating a buildup of debris. How does one form? When heat from inside your home drifts into the attic and warms your roof and melts ice. As this melted ice rolls to the roof’s edge, it refreezes and creates an ice dam. Proper attic insulation and ventilation is the solution. Condensation: Condensation can gather in your attic when a cold roof comes in contact with warm air. Condensation can lead to dangerous mold. If you have condensation, call a professional for assistance. The solution typically includes improved attic ventilation and insulation. Icicles: When temperatures drop below freezing on sunny days, icicles often form. 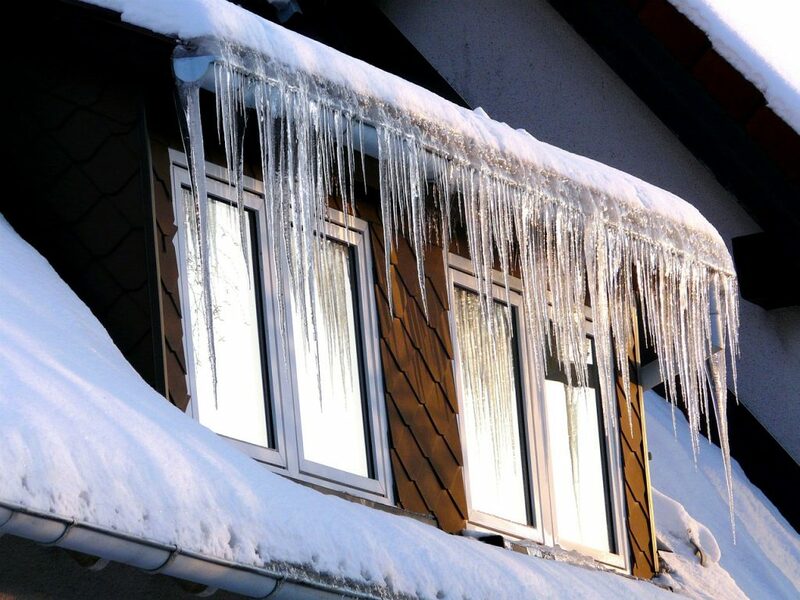 Icicles appear in clogged gutters and downspouts, and they can create danger to people and damage for your roof. Reduce the chance of icicles forming by clearing gutters regularly, and make sure to perform gutter maintenance when spring arrives. Snow Loads: Roofs are designed to withstand snow loads — especially in cold weather climates. But significant snowfall and ice accumulation can surpass what your roof is designed to withstand. Make sure to clear excessive accumulation, and keep an eye out for severe roof leaks, cracks in wall and masonry and water accumulation in non-drainage areas. If you have questions or concerns about your roof this winter, contact HomeStar remodeling. We provide roofing service, repair and replacement in Delaware, South New Jersey and Pennsylvania, and we can provide expert guidance as you prepare for the coldest months of the year. Contact us today about getting your roof into peak condition this winter.